Portland, Oregon, now has a cycle rental/sharing program like New York, London, Paris and many other cities (and some wards of Tokyo). 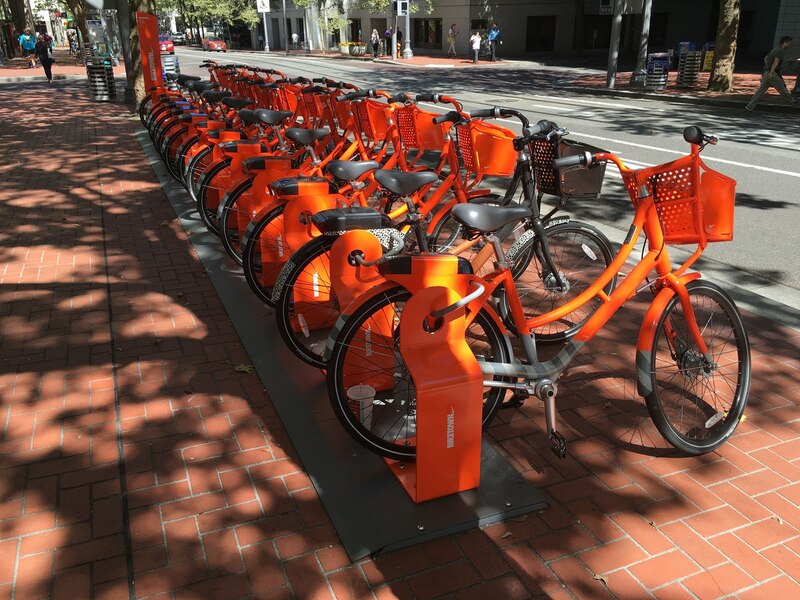 It is sponsored by Nike, headquartered in the Portland suburbs, so the bikes and stations are the same orange as Nike shoe boxes. Of course, official Nike stores are called "Niketown" so the bike program seems to go by "Biketown." I did not see many people using the orange bikes, since most Portlanders who want to ride a bike ... have one of their own and use it daily. But I was glad to see a news report this evening (Aug 31) that the program exceeded its first month target, with more than 59,000 trips recorded. The "Biketown" name is a bit lame, whether for a bike sharing program or a city. After a visit to one of Portland's 65 breweries for some craft beer yesterday, I think "Beervana"is the winner. The Spectacular SIR Summer "Gravel Grinder" 600k!